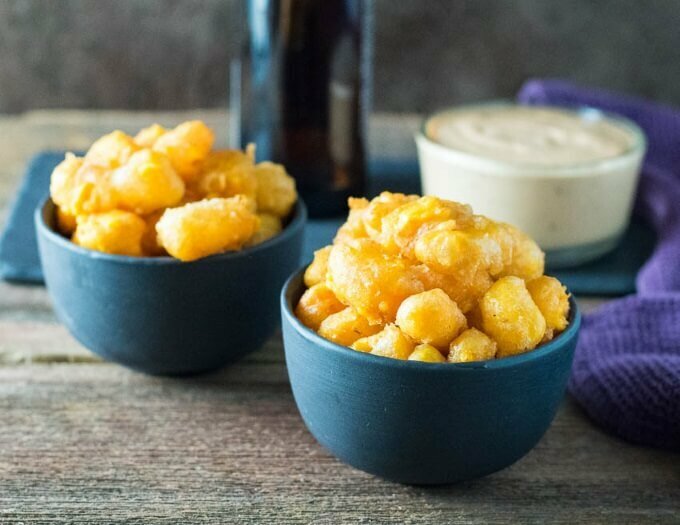 Beer Battered Deep Fried Cheese Curds are a classic Wisconsin appetizer featuring gooey melted cheese waiting to ooze out of a crisp beer flavored crust! In Wisconsin, we are the land of beer and cheese. Oh, and –insert obligatory Green Bay Packers reference here-. God gave Wisconsinite’s two hands, one to hold cheese, and the other to hold a beer. However one day, someone brought a Wisconsinite a second beer and he had no free hand to hold it, so he proceeded to dump it in with his cheese and deep fried it. Thus, Beer Battered Deep Fried Cheese Curds were born. It went something like that, I’m sure. If you live outside of Wisconsin, you likely never have seen Beer Battered Deep Fried Cheese Curds on your restaurant menu. And for that, I’ll lather you with a level of pity typically reserved for crippled puppies. 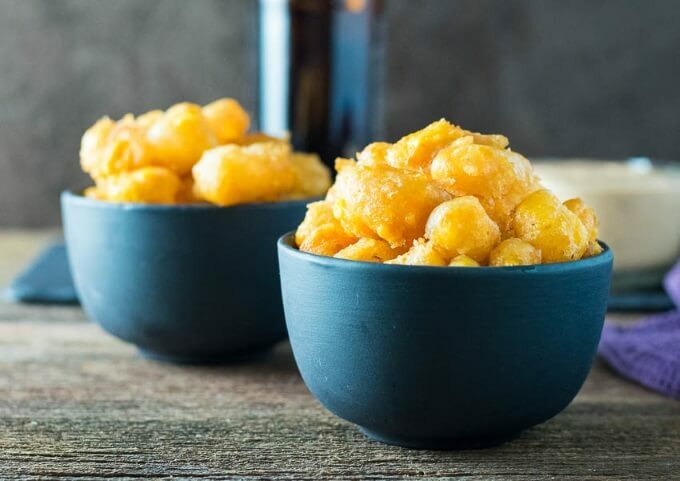 However, deep fried cheese curds are a staple in Wisconsin restaurants, with beer battered cheese curds being the crème de la crème of this ultimate comfort food appetizer! I love writing about Wisconsin food, and this recipe in particular I’ve been wanting to publish for the past year. Wisconsin has a number of culinary traditions I’m determined to spread nationwide: The Friday Fish Fry is certainly one (who doesn’t want to eat beer battered perch on a Friday evening? ), and deep fried cheese curds are the other! Gooey melted cheese encased in a crisp beer flavored crust, who wouldn’t want that? Oh, and don’t forget to wash it all down with the quintessential Wisconsin cocktail, a Brandy Old Fashioned! My wife likes using my Comeback Sauce recipe for dipping cheese curds. I like using chipotle ranch, though ketchup and marinara sauce works as well! Deep fried cheese curds are typically made with cheese curds, obviously enough. However, don’t despair if you live outside of Wisconsin and can’t find this squeaky treat. You can use a block of mild cheddar and cut it into ~1 ½” x ¾” rectangles to mimic the curd shape, however simply cutting 1” cubes would also be fine too. 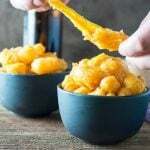 My Beer Battered Deep Fried Cheese Curds recipe calls for a pound of cheese curds, however if you buy a different sized bag, the recipe will still work well. You just may have some batter left over. Your beer batter for deep frying should be like a thin pancake batter, a consistency similar to paint. My recipe calls for a cup of beer, however if the batter is still too thick, add another 1 – 2 tablespoons of beer to thin it out to the correct consistency. If you thin it out too much, add a small amount of flour to thicken it slightly. Before you dive into deep frying your entire batch, test out one curd frying in the oil. You will be able to see if your batter is the right consistency and make adjustments before you accidentally ruin the whole batch. Plus, you get to snack on one early! You will also want to have a good instant read thermometer to monitor your oil temperature. Proper oil temperature is essential anytime you are frying food, too hot and your food will burn, too cool and it will become oil logged. I never deep fry without one. Rather than buying a specific deep frying thermometer, I like using the same instant read thermometer I use for cooking meat (this is what I use) because I like tools that can multitask. The above links may be affiliate links. 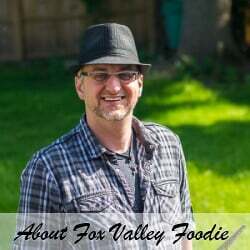 Any Amazon purchases made through these links help support FoxValleyFoodie.com at no additional cost to you. Add beaten egg and beer and mix till combined. The batter should have the consistency of thin pancake batter. If it is too thick add additional beer as needed. If it is too thin, sprinkle in a little flour. Deep fry one cheese curd to test the batter if needed. Working in batches, add cheese curds to the batter and evenly coat then lift cheese out of the batter with a spider or slotted spoon and let the excess batter drip off before placing in the oil. Fry for 1 minute then remove curds to drain on paper towels. I found anywhere between 375 - 400 degrees to be a good frying temperature. Oil temperature drops when food is added, so by heating your oil to 400 degrees it should stay within the proper range when frying. Frying in batches ensures the oil temperature doesn't drop excessively and also ensures the cheese curds aren't too crowded in the pan and clump together. I found 1 minute to be the ideal cooking time, however if you see cheese leaking out while frying they have been frying longer than needed and should be removed. 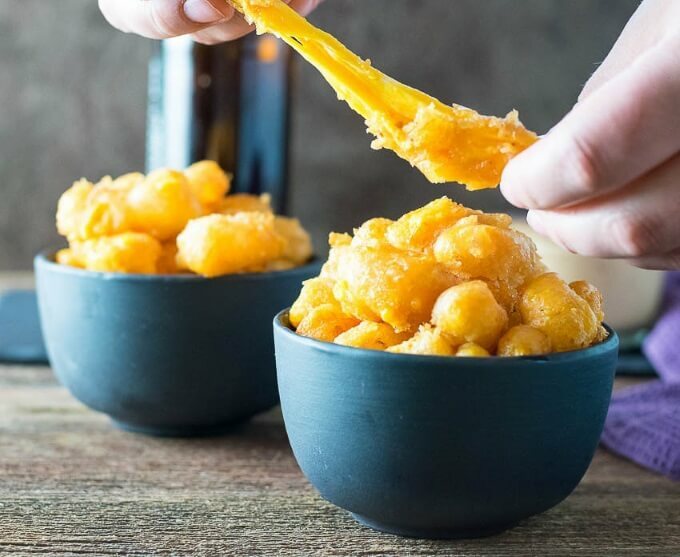 If you enjoyed reading my Beer Battered Deep Fried Cheese Curds recipe then you should probably like me on Facebook and follow me on Pinterest too. That’s what I would do at least, because if you don’t get to know me but you still use my recipe it is kind of like taking candy from a stranger, and your mom taught you not to do that. Don’t disobey your mom, subscribe to Fox Valley Foodie today. I do not live in or near Wisconsin, but I do enjoy a good fried cheese curd now and again. I don’t think I’ve ever had them beer battered, though. I highly recommend giving them a try. I’ve been in love with them ever since I first discovered them at a county fair a number of years back. It is on my “must have” list every time I go to any fair. Anyone who makes cheese curds for their partner is a keeper! Small batches are a must. (4-6 curds in a 8″ deep fryer). We were impatient towards the end and put 10-12 in. They clumped together and oozed out. A mess in the oil. Can we not use beer? Will they turn out ok? 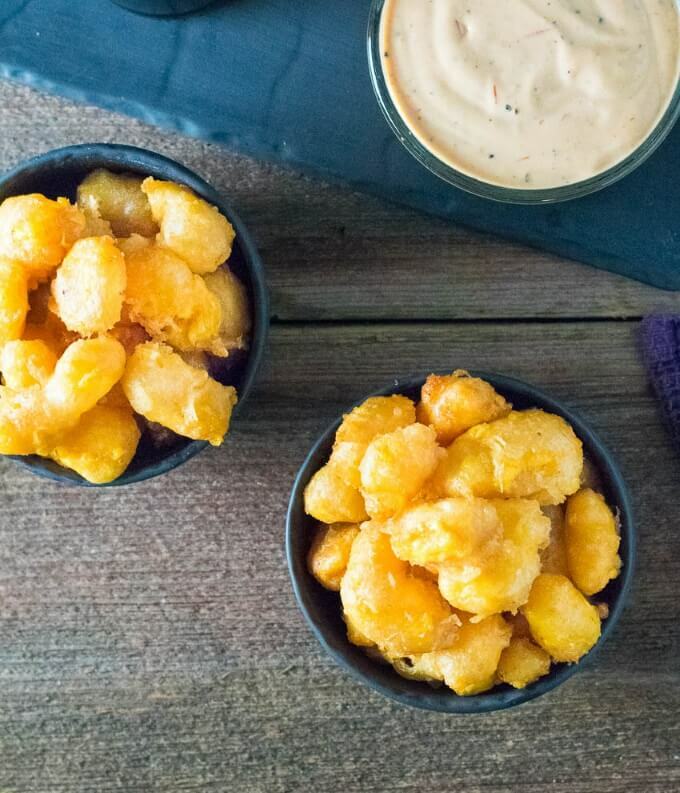 Yes, there are plenty of cheese curd recipes that don’t call for beer. Rather than trying to modify a beer-centric recipe you will likely have better results seeking out a recipe specifically formulated without beer. Traditionally a simple light beer is used. Any brand will do. My point was that your recipe makes it so I don’t have to wait in line and can make these curds of gold any time!! I recommend freezing the curds first. I put them on a cookie sheet lined with parchment paper or tin foil and put them in the freezer. I them bag them so I have curds at the ready when I’m craving them. Freezing first keeps them from running and falling apart. did you freeze them with the batter on them? What type of oil do you use?? Any that you have on hand will work, but I prefer Canola because of its high smoke point. Extra Virgin Olive oil would be my last choice. Thanks for a simple yet perfect recipe. This was my first attempt at fried curds and I can definitely say it wasn’t the last! Thanks for posting this! I am in Virginia, but have a Wisconson-ite staying with me, who brought some cheese curds with him. His first comment was “Wow, this is what they’re like at the places that know how to fry ’em; the batter is airy and perfect!”. That said…my deep fryer only goes to 350, and I would agree that 375-400 would be the better temp, so the batter cooks and ‘seals’ faster, before the cheese really starts to melt. Even with that…90 seconds seemed to be all they needed.